One of the highlights of my eating excursions this summer was having the opportunity to dine at the famed Greenwich Village restaurant- Gotham Bar & Grille- with my bf and his amazing mom! 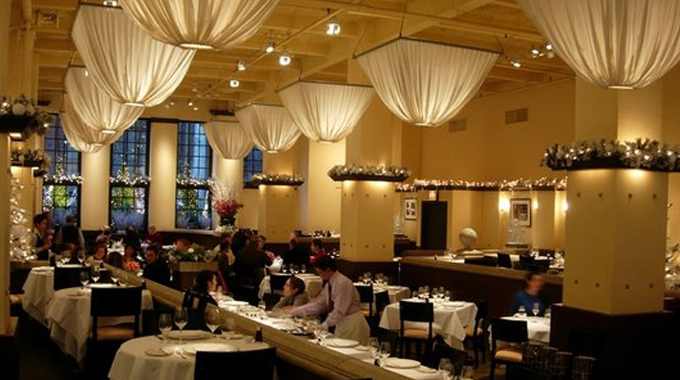 Gotham is a beautiful restaurant- stylish, but it still felt warm and inviting. I really loved the feel of the high ceilings, pretty fabric-draped light fixtures and grand floral arrangements that decorated the restaurant. The food was fantastic and so skillfully presented. How could I not take pics of everything before I devoured it? The first courses were phenomenal! We had the intricately prepared Yellowfin Tuna Tartare, with Japanese cucumber, shiso leaf and sweet miso asian ginger vinaigrette and the delicious, perfect-for-summer dish, the Soft Shell Crab that featured summer squash, sweet corn, fresh chickpeas, purple eggplant, roasted red pepper, and a lime ginger emulsion. 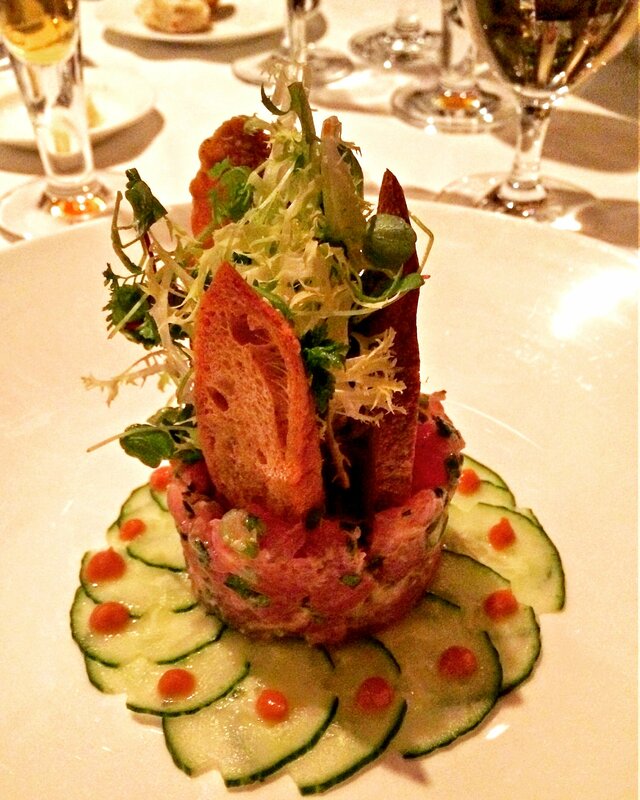 The tartare was so fresh and paired nicely with the acidity of the vinaigrette. 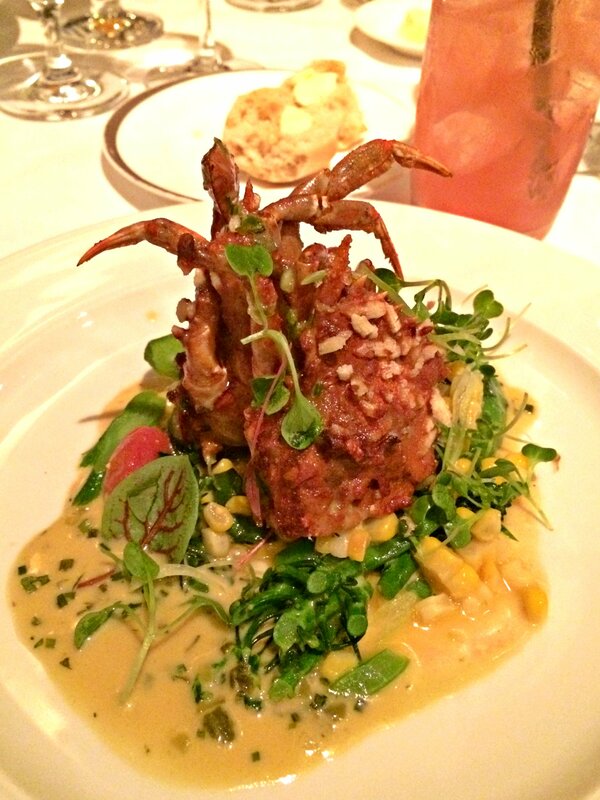 I’ve always been a huge fan of soft shell crab and this was hands down my favorite soft shell crab dish ever! It was so flavorful and the combination of the summer veggies with the creamy, yet light, sauce and the crunch of the soft shell crab was outstanding. It was so good and both dishes had such a lovely presentation! It’s one of those things where you really kinda feel bad for destroying the artistry of it all… but not bad enough to not eat! 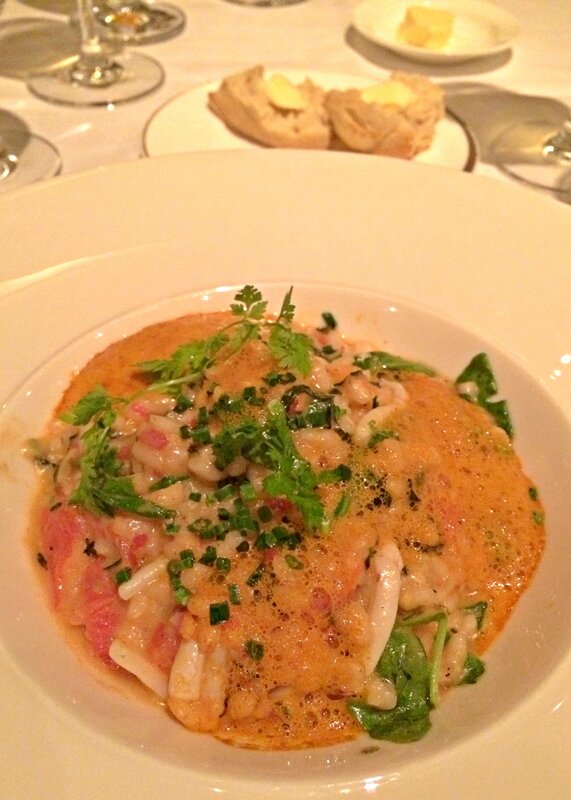 My second course was the Seafood Risotto with ruby red shrimp, calamari, jersey tomato, pancetta opal basil, wilted arugula and Calabrian chile. YUMMMM. It was rich, filling and the seafood was very tender. And the salty, savoriness of the pancetta only made the flavors even more awesome! 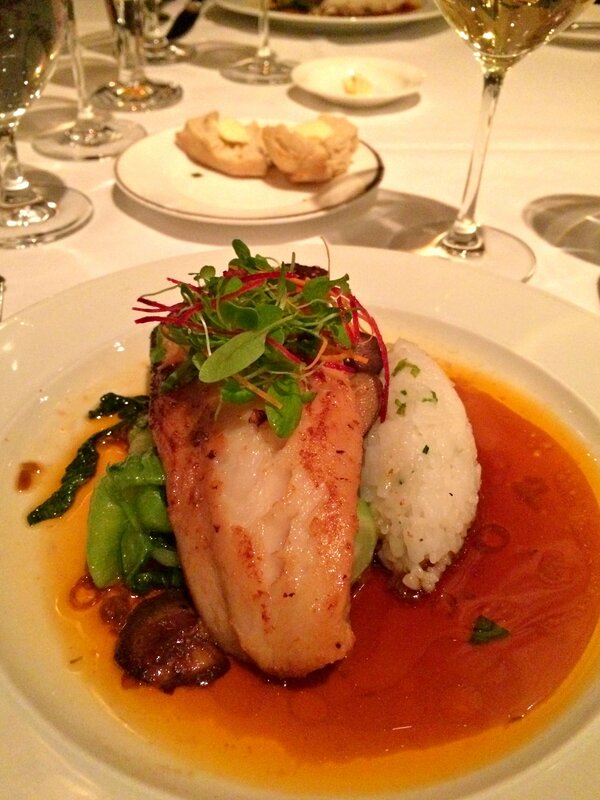 For the main course, we all ordered the Miso Marinated Black Cod with bok choy, shiitake mushrooms and a soy lemongrass ginger sauce served over a bed of sticky rice. The cod was prepared perfectly- it melted in my mouth! It was tender, buttery-soft and fabulous. I don’t usually even order fish, but this was a very good decision. The mushrooms were like little buttons of tasty heaven- they soaked up all the flavors from the sauce. Also, bok choy has always been a fav veggie of mine, so this whole dish was a winner. 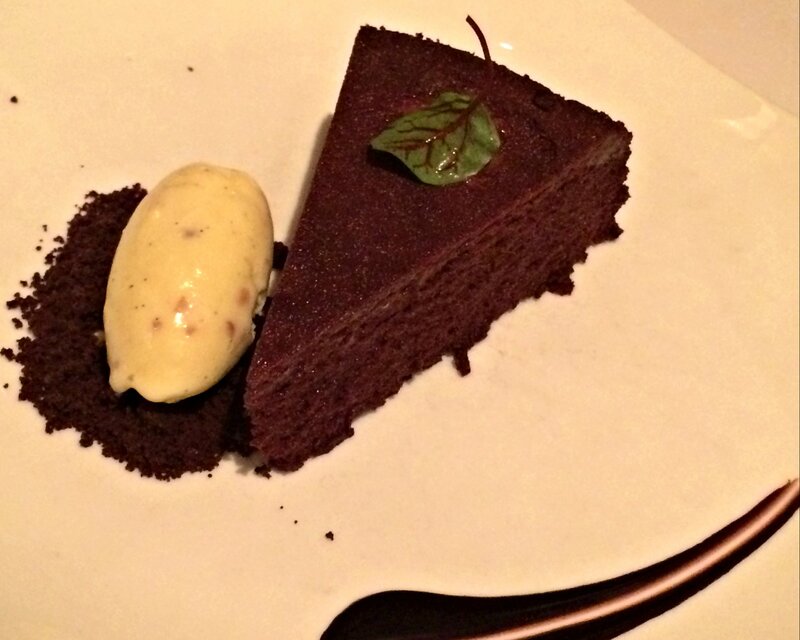 For dessert, we had to go for their top choice, the Gotham Chocolate Cake served warm with salted almond ice cream! The cake was rich, dense and super chocolatey. That, along with the ice cream, made for an unbeatable, excellently balanced dessert! They also sent over some cute, mini madeleine bites with our coffees 🙂 If you have the chance to eat here- don’t hesitate! Oh my gosh, how gorgeous does that food look! I am getting soooo hungry just looking at those pics! Wow I need to go here. Love the post and beautiful pictures!